DNA analysis is the great work horse of forensic investigations. However current tests to determine what should be sent for DNA analysis are not up to scratch. Current tests determine if a sample is a specific human body fluid have many false positives and consume evidence. In some cases if there is not a lot of sample present no testing will done and the sample will be sent directly for DNA analysis. Samples sent for DNA extraction may end up not being body fluids at all or may contain no human DNA. This in part has contributed to a backlog of hundreds of samples, which were never tested. Fig. 1. Red blood cell under 100x magnification. 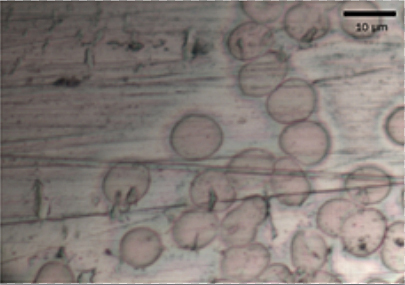 Isolated cells like this were used for analysis. Using a technique new to forensic biology, a new method of identifying body fluids has been developed. The technique, called Raman spectroscopy, is widely used in other forensic disciplines but is relatively new to forensic body fluid analysis. It uses laser light to create a spectra, where the different peaks correspond to different vibrational modes represent specific chemical groups. A Raman spectrum is a molecular fingerprint, providing very specific information about composition of complex chemical and biological samples such as blood. Previous research has been done on a statistical model that can differentiate between the body fluids using Raman spectra. A large library of spectra from all the body fluids was compiled and a mathematical program was applied to it. The program finds the differences between the spectra at a numerical level and can differentiate them with a high accuracy. In order for this technique to be used on a real case, it must be able to deal with a wide variety of sample types. In some cases crime scenes have been cleaned to conceal a crime. However small amounts of body fluids may escape the cleaning because they are small and hard to find. This technique must be able to deal with these tiny microscopic traces as well. Fig. 2. 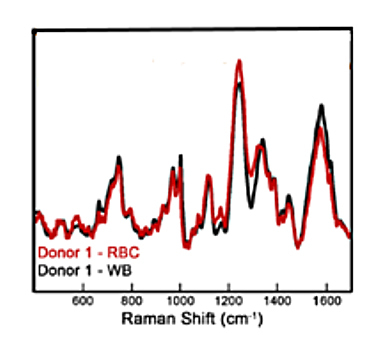 Raman spectra of a red blood cell (RBC) compared to that of whole blood (WB). Blood is one of the most common body fluids found at the scene of a violent crime. To show that this new technique can be used with very small amount of blood, spectra of individual red blood cells from five different donors were compared to spectra of whole blood. Red blood cells contain a significant amount of the protein hemoglobin which gives them their red color. The spectrum of whole blood is mostly dominated by peaks from hemoglobin, so the spectra of whole blood, and a single red blood cell are very similar. The newly acquired spectra of single red blood cells were loaded into the statistical model to see if it could tell them apart from whole blood. The statistical model predicted all of the red blood cell spectra as blood with 100% accuracy. This research has shown that all that needs to be present for forensic identification of human blood is a single red blood cell. This is approximately 5000 times less than is needed to acquire a full DNA profile and 8 times smaller than the amount needed for the current most sensitive human blood test. This shows the great power of Raman microscopy combined with advanced statistics and how much better forensic analysis can get in the future. Identification of individual red blood cells by Raman microspectroscopy for forensic purposes: in search of a limit of detection.